When You Need More Power For High Heat-Loss Areas, Broan's Large Capacity Wall Heaters are an Ideal Solution For Lobbies, Entrance Ways, Vestibules or any Area Requiring High Wattage Heating. Our Low-Profile Models Feature an Energy-Saving, Built-In Fan-Delay Switch Allowing the Heating Element to Warm Up Before Fan Starts. 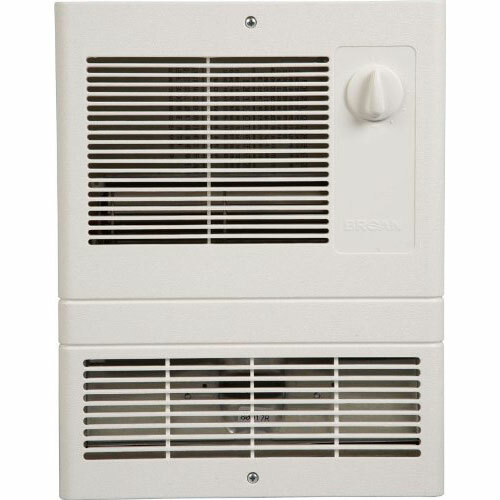 To Ensure Proper Shutdown, and Maximize Heat Delivery, The Fan Remains On as the Element Cools Down Broan 9815WH High-Capacity Wall Heaters Attractive White Grille - Exceptionally Durable and Heat Resistant Quiet Fan and Downflow Action Circulates Heated Air Quickly Two Models Offer Wattage Choice: 1000W or 1500W. Heaters Easily Wired at Installation for 120V or 240V. Over Temperature Protected by Thermal Fuse< Built-in Adjustable Thermostat. Quiet Thermally-Protected Motor and Transverse Flow Blower Long-life Bearings with Extra Large Oil Reservoir Hang Tab Aids Installation MOTOR: Thermally Protected, Shade Pole, Sleeve Bearings On/Off Switch Provided as Part of Thermostat. When you need more power for high heat-loss areas, Broan's 9815WH large capacity wall heater is an ideal solution for lobbies, entranceways, vestibules or any area requiring high wattage heating. Factory wired at 1,500 watts (120V AC), it can be easily converted to 1,500 watts at 240V AC for added versatility. It provides a rapid warm up time thanks to an efficient alloy heating element that provides comforting heat in seconds. The 9815WH's quiet, thermally protected motor shuts off in event of overheating and transverse blower circulates heated air downward for optimal room warming (UL Listed for safety). An adjustable, front-mounted thermostat offers a simple way to control the level of heat. The white, polymeric heat resistant grille has contemporary styling with radius edges, straight louvers, and subtle contours for a clean, attractive appearance. The grille measures 13-3/4 x 11-9/16 inches, while the housing measures 12-1/2 x 10-1/2 inches. Why Spot Heating Makes Sense in Your Home: You hastily get ready every morning, head for work, the office, or school, just when the central heating system has finished warming the entire house. It's about as inefficient as it gets. Spot heating solves that problem. No longer will you heat an entire home when you simply need a bit of comfort in the bath or dressing room, or any other room. Efficient Heating Element: Even the most efficient central heating systems send heat up the chimney. But Broan spot heaters deliver every bit of energy back into your home. There's no external venting, so the electricity you convert to heat is delivered directly where you want it. Simple, Safe, and Efficient: Permanently lubricated motors are quiet and require no maintenance. They can be operated by a built-in adjustable thermostat or an optional wall-mount controller. Heaters may be converted in the field to a choice of wattages/voltages. And for safety, heaters are thermal overload protected and the complete heater assembly conveniently removes from the housing for cleaning. Quiet, thermally protected motor shuts off in event of overheating and transverse blower circulates heated air downward for optimal room warming. UL Listed for safety. Hang tab aids installation The casing measures approximately 12" W x 10" H x 4" D. The exposed grille, on the other hand is 15" W x 12" H.
Brand New, in the box, never before installed. Sold with manufacturer warranty in tact. Broan Nutone is the industry leader of bathroom exhaust fans, bathroom ceiling fans, bath ventilation fans, bathroom fans with lights, heater/fan/light combination units, built-in heaters, and attic ventilator fans.